When we got to the hospital, I had to wait in the waiting room for what seemed like a really long time in very uncomfortable chairs. Duncan rubbed my lower back. Did I mention that I have NO tolerance for pain? I am such a wimp. Really I am. When I finally got back to the Labor and Delivery room and was checked, it was determined that I was 2cm. 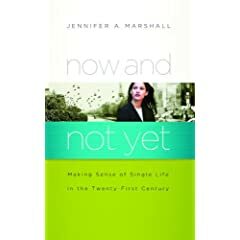 I had told myself that if I was 8 or more, that I would labor for a bit, but at only two, I was afraid of a repeat performance from my experience having Amelie--labor and push for a really long time and then end up with a c-section anyway. "WHAT!?!?" I exclaimed, to which she quickly corrected herself. I think she was just stunned by Violet's size AND she was a non-native English speaker--her name and accent were French. Can you see it through the blur? That's right. 10lbs. 10.5 ounces. I was SO thankful for the c-section at that point. It turned out that she was 23" as well. ENORMOUS! Here's our little sumo wrestler after her first bath in the recovery room. Here's one of her busting out of the hospital issue t-shirt. Here we are on Friday morning. Violet gave Amelie this shirt when Amelie came to meet Violet. Amelie was VERY excited to meet her baby sister, Viyet. The first of many love pats. This is one of my favorite pictures from Violet's birth. I believe this was Saturday. This was Sunday morning before we were discharged and I was trying to be artsy. I LOVE baby feet. As I've said before, my experience with Violet was the simplest. 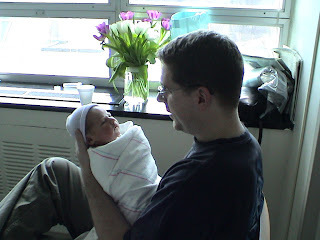 Part of my struggle with scheduling a c-section was "choosing" my baby's birthday. I felt very strange about that aspect of things. So, I love that she came on God's time rather than mine. I recognize had she been born on Friday the third, that would have been God's time as well, but you know what I mean. Her arrival was unexpected and a surprise, and I was thankful for that. 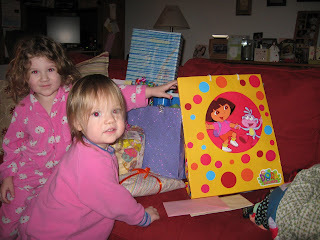 Violet was completely planned to come around Amelie's 2nd birthday. I even had the same due date range--around Valentine's Day. I was ready to have another baby, as Amelie was well into toddlerhood-- walking, talking, and no longer nursing. My pregnancy with Violet was the least complicated. The main struggle was VBAC vs. repeat c-section. I can't even tell you how many conversations were had about this topic--with friends, doctors, family, Duncan, etc. I REALLY WANTED to have a VBAC, but the complications involved and the potential size of this baby were the main reasons for my apprehension. Because Amelie was so big, I had an early glucose tolerance test, to see if a late development of gestational diabetes was the cause for her ginormity. 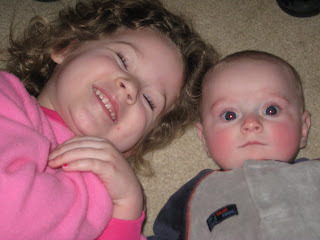 (The number one question I am asked when people learn how big my babies were at birth is if I had gestational diabetes.) Fortunately, it was negative, as was the one I had at the normal time. I had ultrasounds every few weeks near the end to get a ballpark on her size. The one I had at around 34 weeks showed that she was breech. She could still turn but it was unlikely. I was so excited! I felt like God had handed me an answer on a platter--I no longer had to think about the dilemma. We started making c-section plans. At around 37 weeks, I had another ultrasound that showed two things--she had turned and she was an estimated nine pounds. I was slightly disappointed, but with her size estimate, still comfortable with the c-section plans. I decided to schedule one, but if I went into labor on my own, before the scheduled date (February 3), I may try to labor a bit and see how it went. As the end of January arrived, I could hardly move. 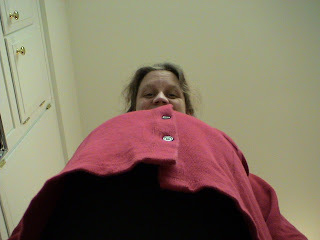 I was ENORMOUS. The above picture is the closest thing to a belly shot that I've got with Violet. It was on my 30th birthday, January 15, which was 18 days before Violet was born. On the morning of February 2, I lost my mucus plug, which, as you may know, means nothing, but it could mean something, in terms of an imminent delivery. 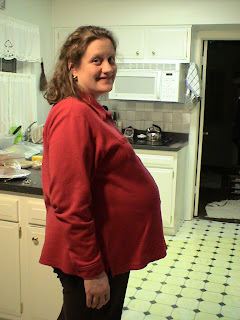 I had actually lost part of it around Thanksgiving, at which time it was determined I was one cm dilated. I was put on "light activity" which meant no more Curves and picking up Amelie as little as possible. I was checked at every visit and remained at one cm until just before Violet was born. 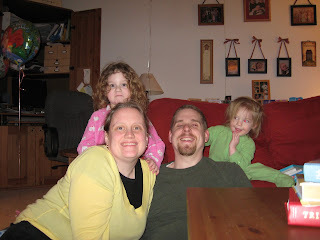 Later that morning, I went to the hospital with Amelie and my mom so I could have some blood work done. My c-section was scheduled for 2:00pm on Friday, February 3rd. After the blood work, we headed to Panera and met my dad for lunch. As I walked around the restaurant during the peak of the lunch hour, I noticed as people stared at my humongous pregnant belly with looks of extreme concern that I might deliver in Panera while they ate their lunches. I told my mom that I wished I had a sign around my neck that said: "Don't worry. My c-section is tomorrow." Amelie and I headed home after that so she could nap and I could make the final preparations before having the baby the next day. As the afternoon wore on, however, I felt more and more intense pressure in my lower back and such, not really contractions, but it was very uncomfortable. I couldn't walk very well and actually resorted to crawling in order to get around. I called the doctor and, since I had lost my mucus plug and had a scheduled section the next day, I was told to go to the hospital. 4:30ish in the afternoon, again. Traveling on the beltway to Holy Cross during rush hour, again. My parents came and got Amelie. Duncan came home from work and packed up our stuff. He was totally annoyed that I had waited to do the majority of our packing that night--I have a hard time packing too far in advance. We headed out and I started contracting on the way to the hospital. That's enough for one post. Check back for more later. But while you wait, does anybody want to guess on how much Violet weighed? I'll give you a hint: It was more than Amelie!! 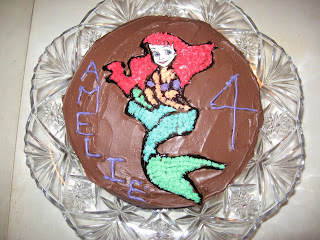 Happy 4th Birthday, Amelie Muriel! Four years ago today, the Lord brought Amelie into the world. To read about how, click here and here. We had a jam-packed, super fun day. 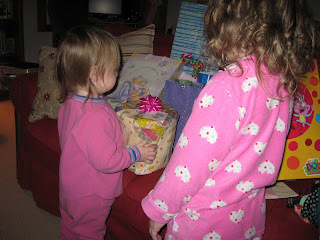 We started out, just before 7:00am, opening gifts. 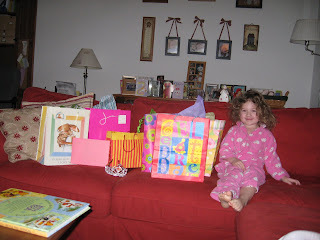 Here's the sweet birthday girl, eagerly anticipating what is inside all of these presents. 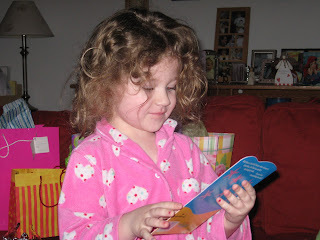 Here she is checking out her Ariel birthday card. Next stop: pre-school! We brought zebra pudding to share with her classmates and then we were off to the dentist for a field trip! Here we are, taking our turn in the chair. Amelie wanted me to sit with her. And why am I wearing sunglasses, you wonder? At this particular dentist, the kids wear them so the light isn't so bright in their eyes. Amelie refused to wear the ones they had for her, but I wore mine anyway. This picture needs no explanation other than that I wasn't as pleased with how this one turned out and I resorted to printing and coloring the picture of the face. Doing it with icing looked ridiculous! 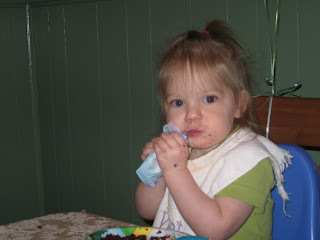 But, the reality is that Amelie LOVED the cake and that was all that really mattered. 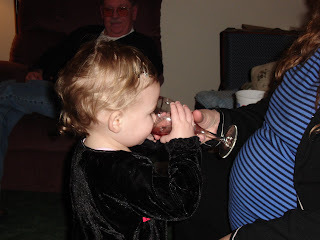 This evening, we had our freighbors and my parents over--some of Amelie's favorite people. We had pizza and pickles and pears for dinner. 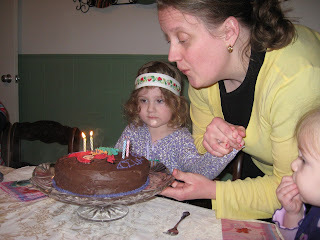 She didn't want to blow out the candles, however. Far too much attention. I think I blew out three of them and my asthmatic dad blew out the fourth one from across the table. I LOVE this picture. We did it with the timer right before the girls went to bed. It isn't particularly good of any of us, it's just fun. It truly sums up the day that we had. So, as I already revealed, we opted for choice number two: a c-section. I was prepped and wheeled into the OR. At some point in my life, I had read about a woman that felt her c-section and consequently had "issues" with her child or something crazy like that. So, I was ADAMANT about them testing me before they started, to which they obliged. 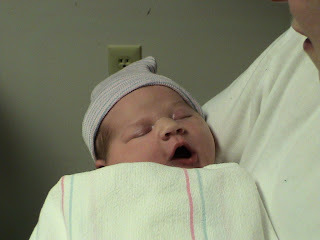 Amelie Muriel was born at 5:09 pm on Thursday, February 19, 2004. I didn't hear "It's a girl!" (In fact I've never heard that phrase during a birth-at least correctly!) because everyone was amazed by her size. I kept hearing things like, "Oh my goodness, that baby is huge!" and "Wow! What a big baby!" I had to ask, "Is it a girl like we thought?" to which they assured me that it was. Upon placing her on the scale, we finally learned what she was trying to tell us. She weighed in at a mere 10 pounds 3 ounces! The first thing I said was, "We beat Jack!" (my nephew that weighed 10 pounds 2 ounces) I couldn't believe how big she was! 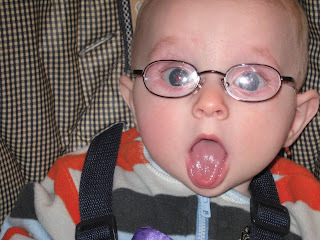 At my 36 week check up, the doctor predicted, "You've got an 8 or 9 pound baby in there." Since my family has relatively big babies--my mom's smallest was 8 pounds 3 ounces--I expected as much. I had assumed her comment meant that AT BIRTH I would have an 8 or 9 pound baby. After learning how much Amelie weighed, I wondered if the doctor had meant that day (at my 36 weeks check up), I had and 8 or 9 pound baby in there! I guess we'll never know. It took a while before I got to see her. 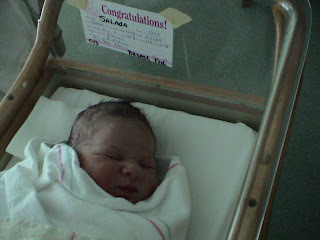 Since she had meconium in her amniotic fluid, she had some extra tests and procedures done, all right there in the OR. I also should mention that I had several nursing students observing as the c-section was performed. One of them (a young man) had actually been one of the people holding my leg as I pushed. They asked permission, of course, for all of this, and I can honestly say I couldn't have cared less who saw me in that predicament. I can say for a while, I mourned not having the birth experience I had envisioned. A few months down the road, a friend shared that her niece, who had dealt with infertility for years and had since adopted, struggled with not having a "birth experience." It occurred to me at that point that I DID have a birth experience, not the one I had planned, but the one that God had planned for me. And that was even better. she turns the page in a book and says, "I click it!" We received a subscription to One More Story for Christmas. (Thanks, Miss Grace!) In order to turn the pages, you can click on a green arrow in the bottom right hand corner. 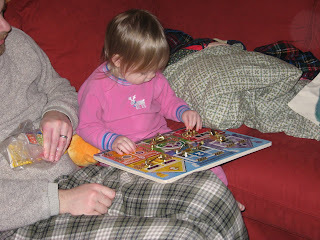 And since Amelie has mastered the mouse, there's a lot of talk about "clicking to turn the page." So, apparently Violet, who is a frequent observer of the stories, has deduced that turning the pages in actual books is "clicking it" as well. Too funny! My friend, Lynn, tagged me for this book meme. "The assurance of a consistent ultimate calling helps us keep our bearings no matter how erratic the seasons may be. If a false spring blooms, understanding our circumstances as a part of our callings prevents us from turning frigid toward life, toward men, toward God. There is no "calling without a Caller," says Os Guinness, author of The Call." I will now tag anyone that cares to participate. Just leave me a comment, so I can check out your results! For a while, I've wanted to record my birth stories. I've seen many people do it on their blogs and I've enjoyed reading the details of their experiences. Ultimately, however, I've wanted to get them written down before I forget the details. Since this is the birth month for both of the girls, I figure it's an appropriate time for it. To begin with, I can tell you that every one of our children was planned. We started trying to get pregnant in the fall of 2002. I got pregnant in January of 2003 and miscarried very early on. I got pregnant again in May of that year with Amelie. My pregnancy was not without complications. I had a weird, yet harmless, problem in the beginning. (I'll spare you any details.) It was freaky until we found out what it was. I had one episode of bleeding on the fourth of July, but then everything continued normally until February. I was due around Valentine's Day, which came and went. A friend told us about the birthday cake trick. You know, you bake the "birth"day cake, so the baby will come. Stephanie, Duncan's mom, arrived on the evening of Tuesday, February 17th from Erie, PA to help before and after the baby's arrival. I had seen the OB that day and had been told I was about a half a cm dilated. 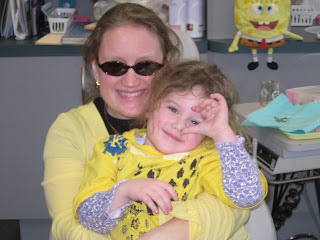 She "stripped the membranes" at that visit and I was scheduled to return later that week, if I hadn't had the baby yet. Fortunately, I didn't have to go back. On Wednesday, Stephanie and I hung out all morning and went grocery shopping after lunch. We bought the strawberry birthday cake supplies. Since we were having a girl, the cake needed to be pink, right? When we got home from shopping, I was tired and decided to take a nap. 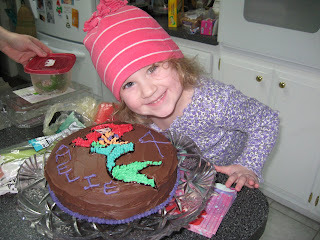 Stephanie was going to make the birthday cake and get dinner prepared. At about 4:30 in the afternoon, I woke up, smelled the cake baking, and my water broke. No joke. (Now, please understand that I do not believe that the cake baking MADE my water break. It was all a joke, to begin with. I just think that God allowed for some humor in the situation.) However, I wasn't sure that my water had broken. I had the "trickle" rather than the "gush." I wasn't feeling anything in the way of contractions. So, I called the doctor and, since it was the end of office hours, they told me to go to the hospital. Duncan got home from work and we headed to Holy Cross in Silver Spring. Which, if anyone knows where we are in relation to HC, you know we had to get on the Beltway at 5:00 in the evening! Our birthing class instructor told us to make "Woman in Labor" signs for the windows, in case we needed to drive on the shoulder, or something crazy like that. So, when Duncan got home, his mom and I were making them (rather than finishing packing) and he was kind of annoyed, he admitted later. Needless to say, traffic was minimal and we didn't need our signs. During the 30 minute or so trip to the hospital, I began to feel contractions. I got there, went into Labor and Delivery and got changed, so I could be examined. It was determined that my water had broken and I was only one cm dilated. So, I was there until I had the baby. When I got up to use the bathroom they noticed my amniotic fluid was "stained" with meconium. That started the use of all of the interventions I had heard about during childbirth class that I DID NOT want to experience. I was never a natural childbirth person because I know myself and my very low tolerance of pain. My goal was to get as far as I could (which ended up being not even far enough to WAIT for the epidural, they tied me over with some stadol or something, at about 3 cm) without an epidural. However, I looked forward to being able to walk around during contractions and using many of the positions we had learned in class, to manage some of the pain. But because of the meconium, I was immediately hooked up to an internal fetal monitor, and consequently a catheter, which had me stuck in bed at one cm! They gave me some cervical gel to help labor progress. 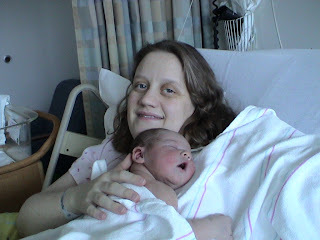 I truly believe had I been able to move around, I would have been able to hold off on the epidural and labor would have progressed better and the c-section (oops, I gave away the ending!) would not have had to happen. However, we will never know and ultimately, I must have been meant to have Amelie the way I did, since I believe I have a sovereign God, who is sovereign over every detail of life. So for the next 18 hours, I sat in bed. As I said, I was given some Stadol before midnight at about three cm, which allowed me to sleep. At around one or two am, the doctor said I was up to 4cm and that I could have the epidural. I waited what seemed like FOREVER for the anesthesiologist. He arrived, successfully started the epidural, which allowed me to sleep a bit more. At around 7am, I was only at 6cm. At that point they started the Pitocin. I finally got to 10cm at around 11am. At that point, the catheter was removed and I prepared to push--finally! However, I can honestly say, I was already exhausted. 2. She could perform a c-section, which might need to happen any way. I was approaching the 24 hour point since my water had broken, so the baby needed to born one way or another very soon. Fortunately, she never went into distress. The doctor said she thought the baby was "trying to tell us something" by not coming out. We would find out what that "something" was shortly. I've just looked at how huge this post already is, so I've decided to make this "Part 1." Check back later for more, unless you've already been bored to tears! 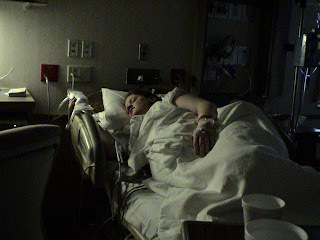 This is me sleeping in Labor and Deliver under the influence of some pain management medication. Either very late on February 18th or very early on February 19, 2004. 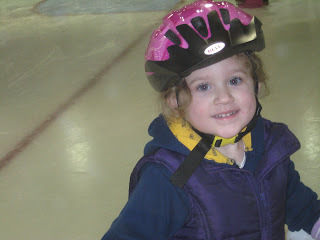 Last April, Amelie took ice skating lessons for a four week mini-session. She decided she wanted to do it again, this time for a full, seven week session. Friday was the first lesson, and she was quite tentative yet EXTREMELY excited. 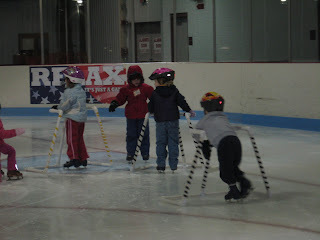 She's the one with the pink helmet in the center of the photo. Here, she was lagging behind while the rest of her class was headed somewhere different. She motioned (through the glass) for me to take her picture. How could I resist? Just When I Thought He Couldn't Get Any Cuter! The picture below is rare. Linus smiles a TON, but I have such a hard time getting him to smile for the camera! As soon as he sees the red eye reduction light, he looks like a deer caught in headlights. Also, the glasses cause the lovely glare that you can see below. 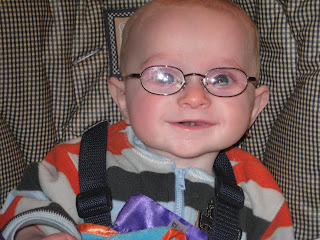 Regardless of all of these things, my Linus just get cuter and cuter every day! He can often be seen with his tongue hanging out. Here's Amelie doing her Linus impersonation. 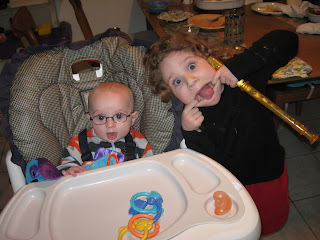 This is one of Amelie's favorite poses with Linus. This looks like it was first thing in the morning, hence the reason for no glasses. I call this one, "Missed Bedtime." Poor guy hung out in the bouncy seat, in the kitchen, by himself while Duncan bathed the girls and I changed everyone's sheets. He didn't cry or complain. He just played himself to sleep. 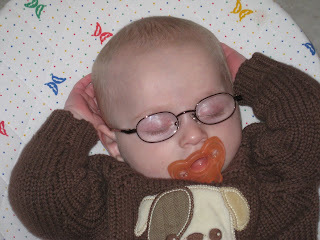 He usually falls asleep rubbing the back of his head, so his hands are often in the position you see in this photo. I could just eat this boy up! Happy 2nd Birthday, Violet Ella! The evening included a birthday dinner of hot dogs, strawberries, blueberries, cherries, grapes, and kiwis. Can you tell what Violet loves to eat? We were joined by my parents and our freighbors (friends who were our friends before they were our neighbors)William and Lucy along with their parents. 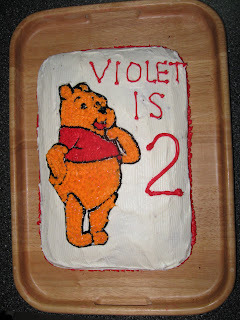 We also had what Violet has been waiting for all week: a Pooh cake! 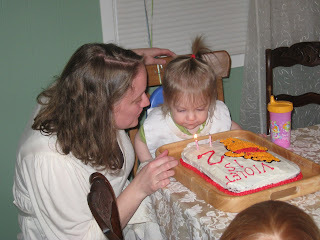 She actually blew out a candle all by herself, right when we were done singing! Here she is wiping her mouth with her Pooh napkin, like a big girl. Here's my first attempt at cake decorating using the bag and tips. I was pretty pleased with how it turned out! And most importantly, Violet LOVED it! Over all, Violet had a great day, playing with her new toys and being around some of the people she loves most in the world. She's such a sweetie and I look forward to seeing what the Lord has in store for her!